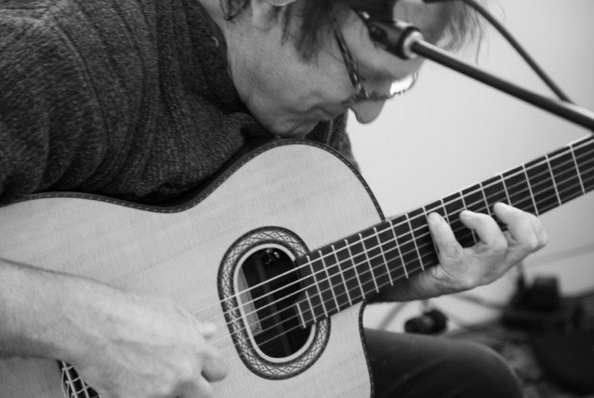 Michael Whitmore specifically plays a nylon string guitar and is the leader & composer for the band Some’tet. Yes, he seems to have disappeared for a about a decade after leaving Los Angeles -- that’s what happens when you move to a rural island in the great northwest and live in a cabin in the woods, start a new body of work. Five years ago Whitmore returned to live performance, initially with a Sunday night residency at the Snapdragon Café on Vashon Island, WA - where Some’tet was born. Now he is performing throughout the Seattle region. Soon, again, he’ll be recording with Some’tet, plus, there’s talk of a brief return to LA to record a solo project. He is a veteran of the LA new music scene with some 2500 gigs under his belt. Some highlights in a long career include a NEA Composers Grant, three acclaimed solo CD’s, working with & composing music for Pulitzer Prize winning poet Franz Wright, and performing on a few dozen albums & soundtracks either as a leader, sideman or as a collaborator. He is also an author, music historian, very often a DJ and always a record collector. Currently he hosts two radio shows on local KVSH 101.9FM on Vashon Island. The greatest influences to his distinctive style of jazz guitar include the likes of Baden Powell, Lenny Breau, Sonny Sharrock, Lionel Loueke, John Stowell & Jon Abercrombie, but he also lists artists such as Brigitte Fontaine, McCoy Tyner and Mark Hollis as huge inspirations. “Isn’t it clear that artists such as guitarist Michael Whitmore must be afforded attention” -- San Diego Reader.